If you are planning an event for a young girl, the on-trend hot theme is Unicorns! These delightful keyrings will be the perfect finishing touch to make it a stand out occasion. 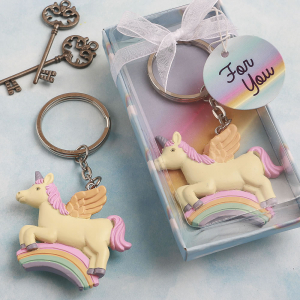 The Unicorn key chain is made of poly resin and features a unicorn flying on a rainbow. The Unicorn is hand painted in an ivory color and has a pink mane and purple hoofs. She flies on a lovely multi colored rainbow. The Unicorn is attached to a silver metal chain and key ring. The perfect hot event favor that will thrill any young lady! Size 1 7/8" x 1 7/8"